For Carnegie Hill Concerts, Easterlin will be performing a minimalist duo with composer and clarinetist Michael Sachs. The two met as students in Boston and have recently been collaborating in intimate performances featuring themselves, their instruments, and a single light bulb. 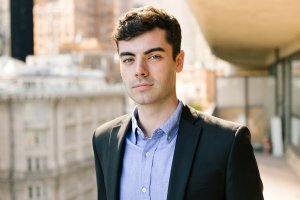 Will Healy is a composer and pianist based in New York. Noted for his “lushly bluesy” sound and “adroitly blended… textures” (New York Times), he is the artistic director of ShoutHouse, an ensemble of 15 hip-hop, jazz, and classical musicians. After playing trumpet in an Afrobeat band for a few years, he grew interested in collaborating with performers from many corners of the New York music scene. In addition, he is an accomplished pianist specializing in Bach, with a repertoire that includes the complete Goldberg Variations and WTC Book 1. Recent awards include a Charles Ives Scholarship from the American Academy of Arts and Letters, an ASCAP Morton Gould Award, and prizes in the Juilliard and Kaleidoscope Orchestra Composition Competitions. Healy recently completed his M.M. at The Juilliard School, where he studied with Samuel Adler, John Corigliano, and Steven Stucky. Violinist and composer George Meyer has performed his own compositions at Chamber Music Northwest (Portland, Oregon), the Telluride and RockyGrass Bluegrass Festivals, and the Savannah Music Festival. in 2016 Ensemble Quodlibet premiered his Concerto Grosso for string quartet and orchestra in New york City. His other performances include those at the Rome Chamber and Aspen Music Festivals. He has appeared with his father Edgar Meyer and with Sam Bush, Jerry Douglas, and Mike Marshall. 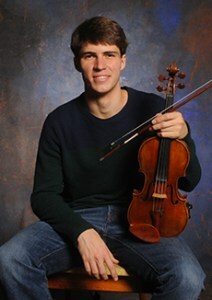 After graduating from Harvard in 2015 with an English degree, he began a master’s degree in violin at Juilliard in 2016.